Choosing the correct thread size for the specific applications is important in the yarn and thread industry, where thread size is the primary consideration for meeting the requirements of the finished product. Tex - Weight in grams of 1,000 m of thread. 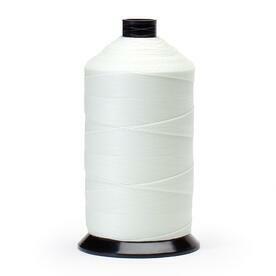 Denier - Weight in grams of 9,000 m of thread. Cotton Count (NeC) - Weight in pounds of 840 yards. Determining the Denier of a thread made up of multiple plies is as simple as multiplying the Denier of the single end by the number of plies used. In this way, a 3-ply product of 1300 Denier becomes 3900 Denier. When twist is added to the ply to make it a sewing thread, it adds anywhere from 1 - 6% to the total Denier (Twist Contraction). Ticket numbers are manufacturers reference for total Denier size since different fibers are only extruded in limited Deniers. For example, a Ticket number 69 polyester is made of 3 plies of 220 Denier, which is 660 Denier. If you add 5% for twist contraction, the total Denier is 693. For nylon only 210 Denier is available, so 3 plies equal 630 Denier. With 5% added for twist contraction the total Denier is 662. Both of these are Tex 70 and Ticket number (Tkt.) 69. This gives an easy approximation of the specific size of the finished thread, which is very close to the Tex size of filament threads. See our conversion calculator if you would like to experiment with other measurements. Below is common industrial sewing thread sizes listed by, Tex size, Ticket number, government size and the constructions by Denier. Selecting the right thread saves time, money, and results in a better product. Let us know if you need help finding the right size sewing thread for your application!